Coverings has been for almost thirty years the preeminent event for the ceramic tile & natural stone industry in North America. For that reason, RUBI Tools can not miss this opportunity to show you the most powerful tile tools on earth. This April 9th to 12nd visit the Orange County Convention Center Orlando at Orlando, Florida to see what makes RUBI the world’s tile tools leader manufacturer. RUBI will be there like never before. We will have our new DELTA Tile Level System and the powerful new TX-MAX tile cutter. And also, we will present some other exciting products such as TC-125 circular saw, RUBIMIX E-10 ENERGY battery mixer, new tools for large formats, high quality glass blades, polishing and grinding wheels/pads and many more for tile and stone. RUBI has always been synonymous with quality and innovation worldwide, and Coverings 2019 will not be an exception. You can see the powerful TZ Tile Cutter, are a new concept in the manual cutting of ceramics, with a separation capacity never seen before on the market and with innovative constructive solutions. 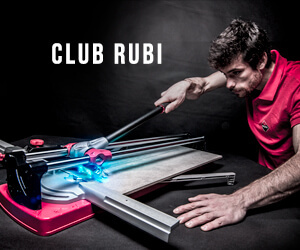 A combination of the latest generation materials and an innovative design, the RUBI TZ is the most advanced manual cutter of ceramic tiles on the market.Their 3306 lbs of maximum power and their exclusive and patented breaker mechanism allow the professional tiller to operate the cutter with one hand, thus facilitating the work with large format ceramic tile. The NEW DELTA LEVEL SYSTEM from RUBI is a system of wedges and strips recommended for 12”x 12” formats or larger with varying thicknesses of up to 1/2″, 9/16” or 3/4″ depending on the model of strip used. The main function of the DELTA LEVEL SYSTEM from RUBI is to prevent the creation of lippage when installing ceramic tiles, both on floors and walls. The DELTA LEVEL SYSTEM also prevents the tiles from moving while the adhesive sets and, during installation, reduces the number of corrections to the position of the tile itself. The basic principle of the DELTA LEVEL SYSTEM is to press down on the highest piece, until it is evenly positioned with the adjacent tiles, thereby obtaining a substantial improvement to the surface planimetry. And of course, cannot miss the new SLAB SYSTEM, a range of products specialized for large formats, which offers the best cutting solutions on the market for large format porcelain slabs, as the well-known SLIM CUTTER or, the new TC-125, a circular saw designed by RUBI, that will cover all professionals’ needs. The Slim EASY TRANS and the new SLAB TRANS HEAVY DUTY, our solution for handling and installation of these materials, complete the SLAB SYSTEM range. A complete range of tools that offers us the best guarantee when it comes to working with such large format pieces. In this tool, as in most of the RUBI catalog, we have had the collaboration of industry professionals and end-users in the design and creation process; this joint work allows us to release products with guarantees that meet the needs of our most demanding customers. For this and many more reasons you cannot miss The Global Tile and Stone Industry this coming April 9th the Orange County Convention Center Orlando at Orlando, Florida. Pass by our booth #3629 to participate in the products demonstrations.